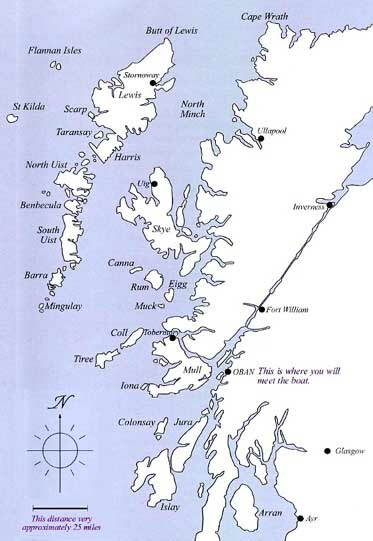 After leaving Canna, and its dolphins, we passed the island of Coll and on to the Treshnish island chain off Mull. This dramatic string of volcanic islands stretch south west from to top of Mull towards Iona. The middle one, Lunga, was our next landfall. Cheerful faces as we disembark. These remote islands can only be visited by small boat, so the locals seemed unfazed by human contact, and allowed us to sit or stand within feet of them. 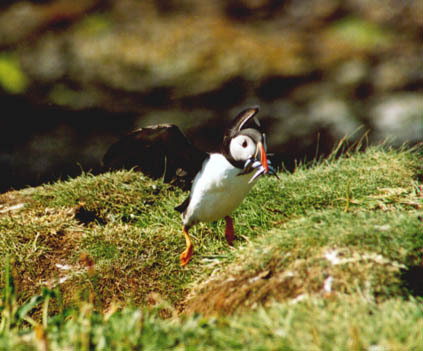 Lunga's Puffins often live in old burrows originally created by the other island's other inhabitants. Harp Rock, or Dun Cruit, was home to literally thousand of noisy Razorbills, Guillimots, Fulmars and Kittywakes, all shoulder to shoulder on every available perch on this rock stack. Below is a closer view of the central rock ledges. Crowd scene !!! 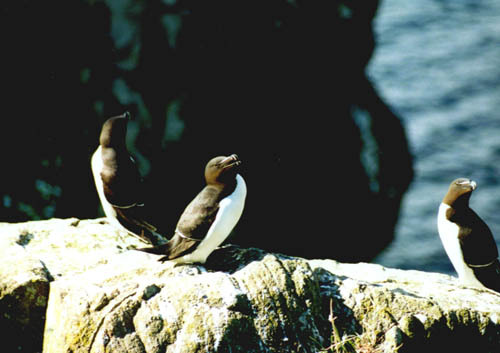 Razorbills, Guillimots, and out of picture, Kittywakes, Shags and cormorants. The highest point of Treshnish, 325 ft on Cruachan summit. After a night anchored in at the island of Ulva, we made our way round Mull, here passing Staffa. To the right, in this impressive basalt cliff, is Fingles Cave. Iona Abbey and its island ferry, as we pass through the Sound. The fore-deck was always a popular place to be, both for relaxing and "spotting". (left to right) Ann, Kirsty, Malcolm, Mark . . . Mark, Chris, Archie and Annie. The workers, posing at Carsaig Arch. Jane, Mark, Alice and (second picture) Chris our skipper. Time for a walk, to work off lunch. The panorama of the bay, with its memorial stone obelisk. We left the boat to motor round the headland, as we walked the seven miles cross country to its next port of call. Lock Spelve old jetty, on southern Mull, as we awaited the arrival of Chalice but two of our number were missing !! Having gratefully accepted a lift up the last steep section of road walk, John and Sheila were to be found waiting on the other jetty opposite. Not quite the plan !! Evening sun on Beinn Bhearnach, Loch Spelve, Mull. Another fine meal, and another magic card trick from Archie, a fellow guest. (and, we discover, a member of the Forth Valley Magic Circle) No matter how hard we tried, he beat us every time !! Return to Oban, to the jetty and Mc Craig's Tower . . . which is where I think we came in . . . just nine days ago.